By Shannon D. Smith. University of Nebraska Press. 2008. 238PP. Illus. Maps. Bibliography. End-notes. Index. Softcover. £8.12. The annihilation of the command led by Captain William J. Fetterman on 21 December 1866 is generally regarded as one of the less controversial episodes of American frontier history. 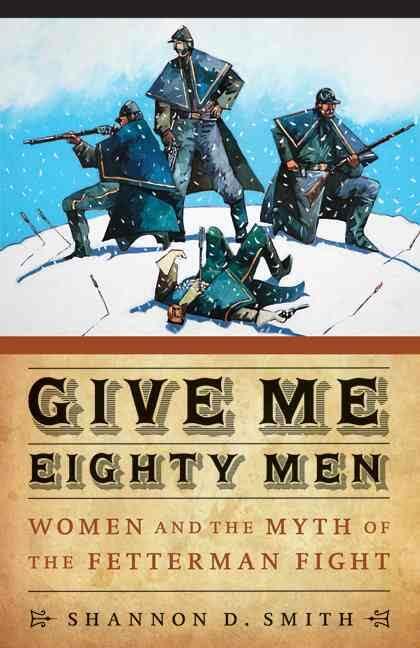 Fetterman is notorious for his reckless boast “give me eighty men and I’ll ride through the whole Sioux Nation!” Whether or not he ever said it and under what circumstances has never been established, though it is clear he did make comments that were not inconsistent with this. In this work, Shannon D. Smith goes further. She focuses on the two books written by Mrs. Carrington and assesses their impact on our understanding of the events at Fort Phil Kearney. She also takes us through the rehabilitation of Captain Tenodore Ten Eyck whose reputation suffered because it was believed he did not take the most direct route to Fetterman’s relief. These themes were to be developed by Professor John E. Monnet in his work published in 2010, Where a Hundred Soldiers were Killed, reviewed in an earlier issue of the Tally Sheet. Fetterman now emerges as a prudent skilful officer: the new villain of the piece was to be Lieutenant Grummond, the basis for this belief being that his men were found some considerable distance in advance of Fetterman’s, and a slightly dubious Civil War record. The possibility that an offensive movement agreement between Carrington and Fetterman beforehand is also explored – a theory considered by the reviewer in an article that appeared in the Autumn 2004 issue of this Journal. Shannon Smith’s work is interesting, though Monnett’s is more comprehensive, and provides a useful background to the events of 1866 and subsequently. But there are errors. She seems to have problems with Brown’s rank – he starts as a captain (which is correct) but is then inexplicably demoted to lieutenant. She incorrectly places the conversation between Carrington, Fetterman and Brown as the evening of the 20th, whereas it evidently took place prior to December 9. But is the controversy settled now? Do we now know ‘the reason why’ the disaster occurred? This reviewer is far from convinced that we do. Margaret Carrington, writing soon after the event, stated that it was not doubted that Brown had influenced Fetterman to exceed his instructions. She did not criticise Grummond. In fact, there is no real evidence incriminating the lieutenant. And what was the role of the two civilians? Why were they permitted to accompany the command? They were found a considerable distance from Fetterman and the main body. Why were they not with the commanding officer? The battle remains an enigma, perhaps more so than Little Big Horn. There is more to this than we have yet seen.